Members of the Michigan House of Representatives released a letter today that summarized the findings of an inquiry into Michigan State’s handling of Larry Nassar, who sexually abused hundreds of patients while working as a doctor for both MSU and USA Gymnastics. 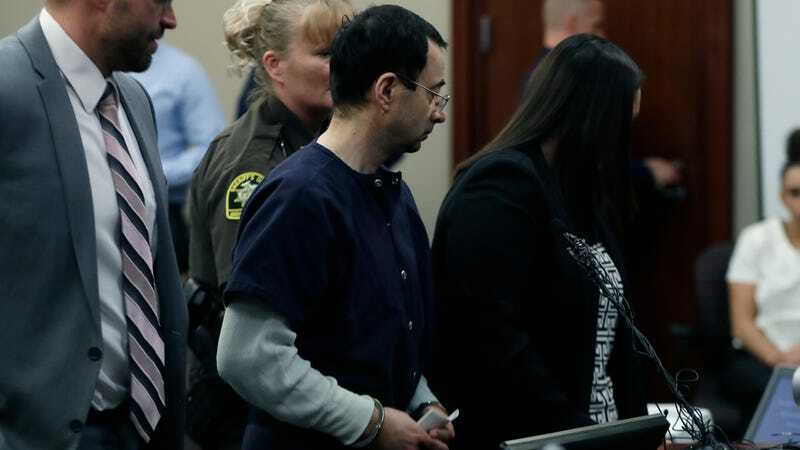 Their findings lay out multiple areas where Michigan State failed to stop a predator in their employ, and several reasons why Nassar was able to get away with his abuse for so long. In addition to noting the specific issues with MSU’s 2014 Title IX investigation of Nassar—which put Nassar back to work before the campus police investigation was finished and imposed new guidelines on him that would only go unenforced—the letter also describes a larger problem of both ignorance and policy loopholes that allowed Nassar to get away with his abuse for so long. Among those “gaps” is the fact that, according to the letter, medical records were not kept for many of Nassar’s treatments/assaults, and many that were kept did not reference the full nature of his methods, which included vaginal and rectal penetration with his ungloved hand. That failure allowed Nassar to argue to investigators that he did not penetrate his patients. Nassar also did not ask for or receive payments from patients or their insurers for many of his treatments, which the letter says should have raised questions sooner than it did. Nassar’s former boss, William Strampel, was charged with criminal sexual misconduct in March. According to the letter, 243 survivors to date have reported abuse from Nassar to the MSU Police Department. The full letter, which includes a detailed Q&A between the representatives and an MSU attorney, is embedded below.